Competitive power marketers supplied about 21% of the retail electricity sold in the United States in 2016, up from 11% in 2005. 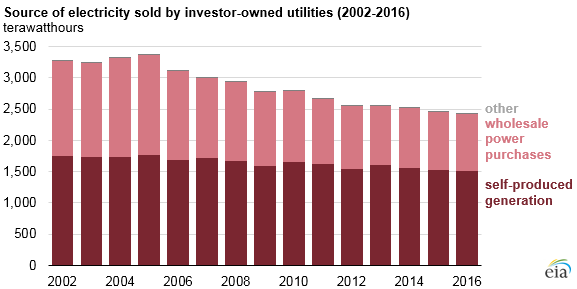 The share of retail electricity sales of regulated investor-owned utilities fell from 62% in 2005 to 52% in 2016. This shift was driven by the Energy Policy Act of 2005, which repealed the Public Utility Holding Company Act of 1935 and closed the original federal regulatory structure established by New Deal-era legislation, which was a combination of public financial reforms and regulations in the 1930s. 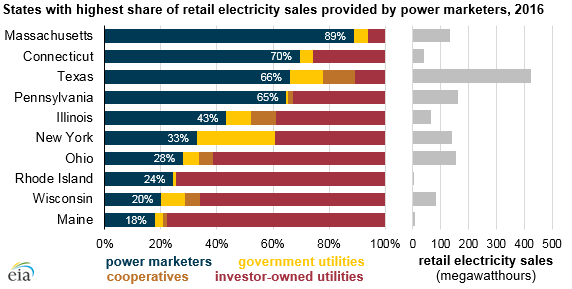 U.S. retail electricity sales are provided by entities with different ownership structures such as power marketers, cooperatives, government utilities, and investor-owned utilities. Investor-owned utilities (IOUs) have historically been the primary producers and distributors of electricity to retail customers in the United States. Some IOUs are still vertically integrated, meaning they offer generation, transmission, and distribution service. Other IOUs may partner with independent power producers to purchase generation service. IOUs are regulated by state and local agencies and also by federal agencies if they own transmission facilities. Retail consumption of electricity has remained relatively flat in the United States over the past decade, especially in the residential sector, where sales per capita have declined. Total retail sales of electricity provided by IOUs have declined over this period, falling from 2,264 terawatthours (TWh) in 2005 to 1,919 TWh in 2016. The U.S. electricity industry was restructured in the 1990s to increase competition at the wholesale level by breaking up the generation and distribution functions of some vertically integrated utilities. In addition, some states deregulated the retail side of the industry by unbundling the electricity delivery and electricity generation components of retail bills. An increasing number of electricity customers have now obtained access to the competitive retail market, giving them choices in suppliers of electric power. Power marketers act as intermediaries between the retail buyer and the generator. Retail sales of electricity by power marketers have risen dramatically in recent years, growing from 412 TWh in 2005 to 767 TWh in 2016. Power marketers have also expanded their geographic scope: in 2004, 98% of all U.S. power marketer sales were in Texas, but by 2016, power marketers were active in many states. Note: Includes electrical losses that occur during delivery to retail customers. As retail sales provided by IOUs declined, IOUs have less electricity for sale in wholesale power markets. 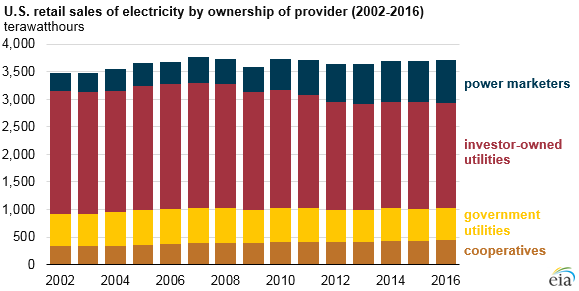 Although the level of generation produced by IOUs declined about 14% from 2005 to 2016, wholesale power purchases by IOUs declined by 45% over the same period.